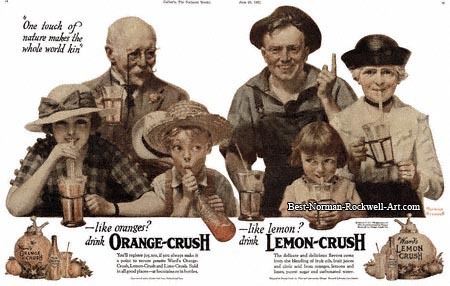 This Orange Crush and Lemon Crush advertisement featured a Norman Rockwell painting, entitled One Touch of Nature. The ad appeared in the June 25, 1921 issue of Collier's. Crush International was just a soda pop company in 1921. 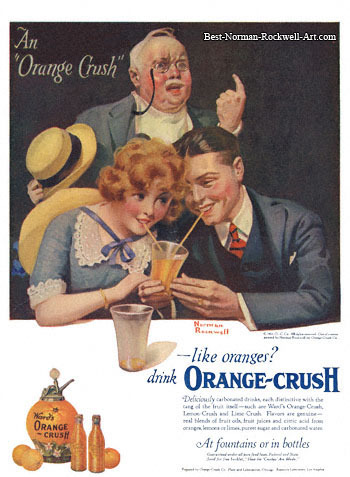 Its original name was The Orange Crush Company in 1916 when the business started. In 1921 Crush contracted Norman Rockwell to paint advertisements. This illustration was one of Rockwell's later Crush advertisements. We can tell this because of the quality of the storytelling in the painting. In all, Rockwell is said to have painted twelve illustrations for Crush in 1921. I have only seen five. He was apparently approaching the limits of his creativity by the completion of the twelfth painting. This painting, while technically and aesthetically everything we expect from Rockwell, lacks the usual humorous and narrative qualities of his finest works. I am nonetheless proud to own a copy. Read more about Norman Rockwell and The Crush Company advertisements here. 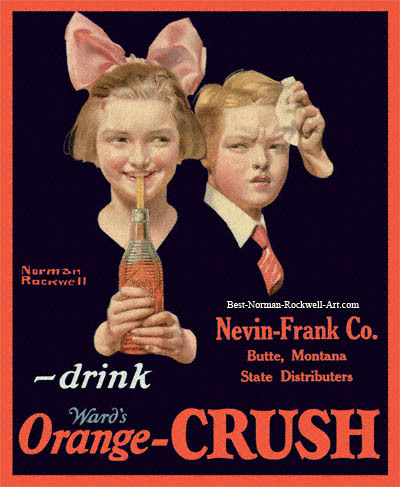 Rockwell's job for The Crush Company was to make sure that the Crush label on the bottle was clearly readable in the advertisement. This mandate sometimes limited his creativity. Here we see six Crush enjoyers. All ages and genders are portrayed. We do not know whether these folks are all members of the same extended family. Or did they all just happen to be at the same soda fountain at the same time? The headline "One touch of nature make the whole world kin" implies that they are not related by family. Their love and appreciation of Crush drinks is what has brought them together. Like Oranges? Drink Orange Crush. You'll register joy. too, if you always make it a point to secure genuine Ward's Orange Crush, Lemon Crush and Lime Crush. Sold in all good places - at fountains or in bottles. Guaranteed under all pure food laws, Federal and State. Like Lemon? Drink Lemon Crush. The delicate and delicious flavors come from blending fruit oils, fruit juices and citric acid from oranges, lemons and limes, purest sugar and carbonated water. Prepared by Oran ge Crush Co. Plant and Laboratories, Chicago. Research Laboratory, Los Angeles. Without a doubt, retail sales of both Orange and Orange Crush acheived new highes after Rockwell painted One Touch of Nature for the company. See the list of Norman Rockwell advertising art.